The Belgian Dutch Virago and Star Club, BDVSC in short, is a Motorcycle club with Belgian and Dutch members who share at least one passion: Their Yamaha Custom motorcycle. 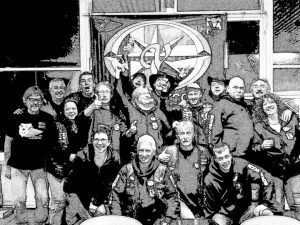 The BDVSC represents the Belgian branch of the worldwide Yamaha Custom Clubs (YCC) network that has resulted in lots of friendships far beyond the boundaries of our national club. A lot of them created at international biker rallies in several countries. There are several YCC clubs for different countries. For example YCCB for Belgium, YCCNL for the Netherlands etc. There are among others clubs in Columbia, Denmark, Finland, Mexico, the Netherlands, Norway, Panama, Spain, Venezuela and Sweden. Furthermore we have fantastic bond with the Virago Star Owners Club (VSOC) in Great Britain. As already mentioned, there is a voluntary participation in international meetings and the club also organizes an annual meeting in Belgium. In addition to these international biker rallies, day trips are also organized at various places in the Netherlands and Belgium, or as a club we participate in rides organized by other motor clubs. It is also possible that a number of members decide to take a ride spontaneously, this will usually be communicated via the agenda, our private Whatsapp group and Facebook. So keep an eye on it if you want to ride with us! We always look forward to meet other Yamaha Custom Bike enthusiasts, so just come on by, or even better …. become a member!